So you’ve had a great idea for a product. You’ve purchased an appropriate domain, installed WordPress and now you want to build the site. That however, will take time. And while you’re working you’d rather not have the world stumbling across a half-finished project and (at worst) dismissing it before you even get things off the ground. This is one clear example of when you need a Maintenance Mode or Coming Soon Page. Whether you are launching a new website, making some much needed edits to an existing one, or simply performing a bit of routine maintenance–these are times when being able to create an elegant and effective maintenance mode or coming soon page can come in real handy. If you happen to be in need of such a page, then you’re going to love today’s post. I’m going show you five different WordPress tools for accomplishing just that. First up, though these tools are in no particular order, is WP Maintenance Mode. This free plugin is a bit unique in that it offers its full range of functionality–which is both simple, yet highly effective–at the free level. Of course that’s not to suggest that the other plugins–those that do have premium versions–do not also offer a high quality experience at the free level, it’s nevertheless nice knowing that you’re getting the full product without needing to upgrade. So what is the full product in this case? It’s a simple plugin that adds a splash-style page to your website that lets your visitors know you are either in maintenance mode or you have a launch of some kind coming up. Once installed it has three sections to its menu (which is tucked under Settings > WP Maintenance): General, Design, and Modules. Under the General tab you are able to change the status of the plugin, bypass search bots, set user level restrictions, and exclude pages you do not want to re-direct to the new splash page. On the design tab the options are seemingly sparse, but in reality it’s just a well designed backend. You have a title space, heading space, and text/html space. Then you can set the background. 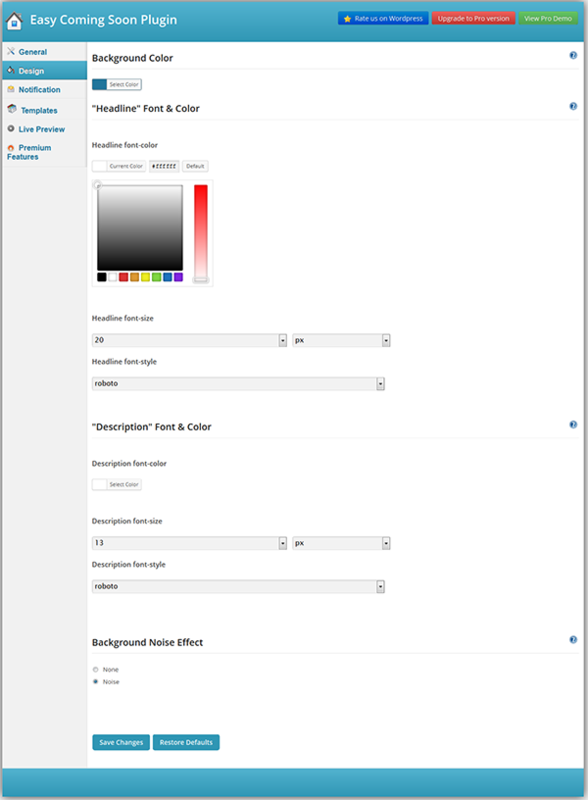 Now this is the section I really like because with just one simple drop-down you can choose to set a color, upload a new image, or choose from a set of pre-loaded high quality background images; making it really easy to achieve an elegant look and feel. Thirdly, we have the modules tab. 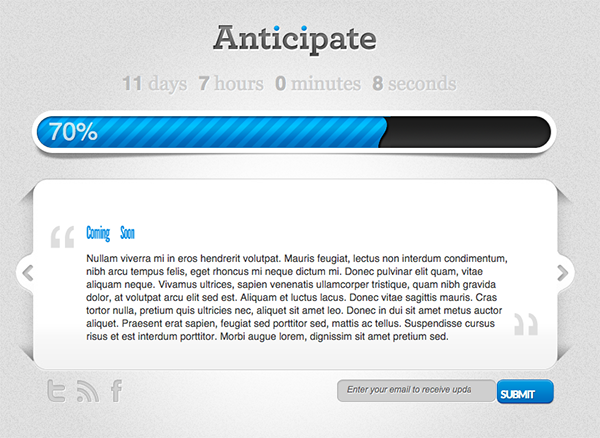 Here you are able to a include a countdown timer, a subscription field, social links, and a contact form. Once all of your settings are configured, all you have to do is click Save Settings and view your new Maintenance or Coming Soon page. As you can see, the results look great and the setup is minimal. Next up we have the Easy Coming Soon plugin. 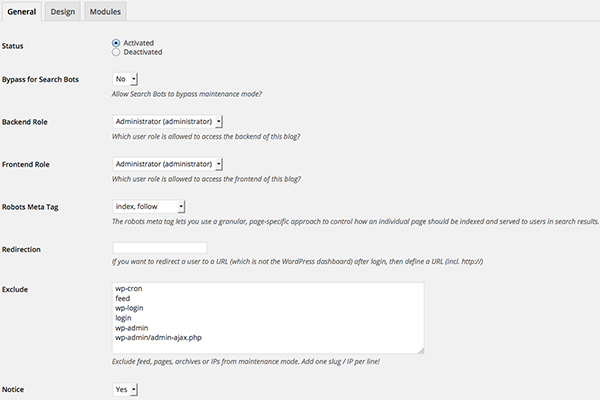 Once installed you will notice a new menu in your WordPress admin called, aptly enough, Easy Coming Soon. Within this new menu you will find a well designed, simple set of tabs for configuring the plugin’s settings. As with our previous plugin, the first tab is titled General. Under this tab you can change the Maintenance/Coming Soon status, add a background image, main content, google analytics and social links. The next settings tab is called Design. In this tab you are able to adjust the background color, various fonts, and even add some visual noise to the background you’ve chosen. All of the other settings tabs are exclusive to the paid version. However, as you can see below, you can still manage to create a decent looking Maintenance or Coming Soon page for any screen size with the free version of this plugin. 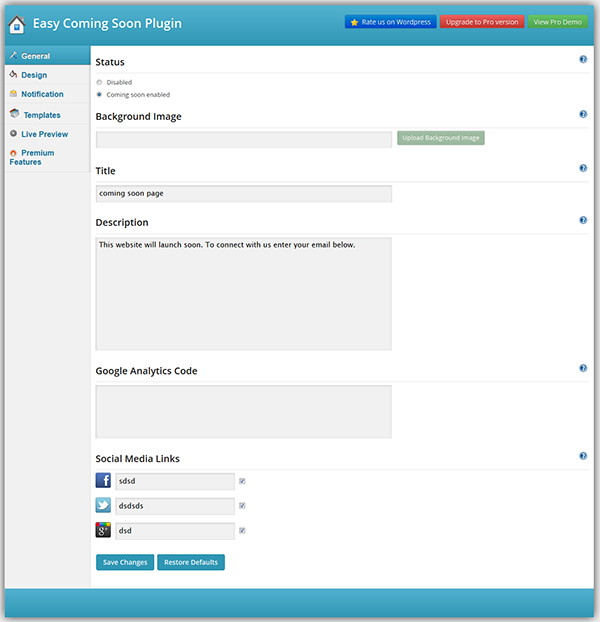 Our third and final plugin for creating Maintenance Mode and/or Coming Soon Pages is the Ultimate Coming Soon Page plugin by SeedProd. This plugin, while perhaps as robust and versatile as you can get in its premium version is just as stripped down as the other plugins above in its free version. That said though, and as you’ve seen in the examples above, you don’t need a lot of crazy features to get a nice Maintenance Mode or Coming Soon page. Is the other stuff nice? Of course! But what you really need is a beautiful background, simply stated content, and the ability to connect with your visitors via email and/or social. 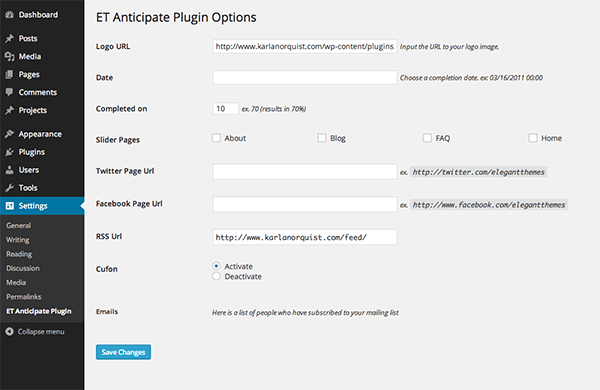 All of which can be done with the Ultimate Coming Soon Page plugin. When you install this plugin, like the first one we looked at, its settings are tucked in under Settings > Coming Soon. Once navigated to you have a simple two tab panel: Settings and Live Preview. The Live Preview is pretty self explanatory so I’ll just walk you through the settings. 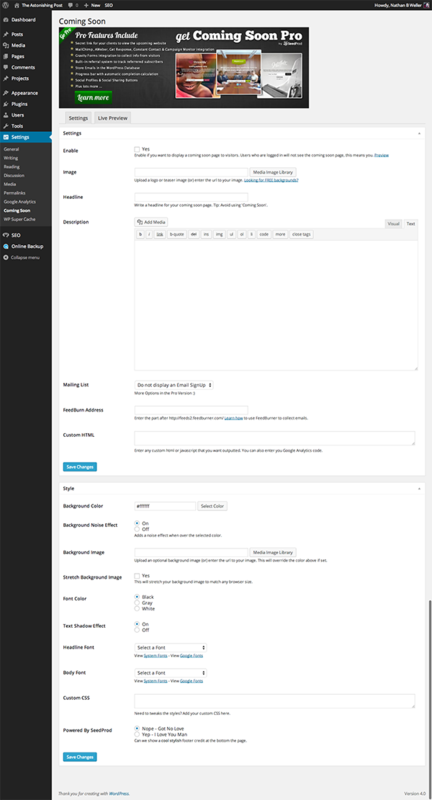 Under the settings tab you’re able to adjust the status (on/off) of the page you’re building, set a background, insert text content, and select an email list to build via feedburner. Under the top settings box you will find the style section. Here you are able to tweak the design elements like background, noise, image dimensions, font color, etc. When it’s all said and done, this plugin is another solid option for creating these types of pages, as the example below demonstrates. Finally we come to the first premium plugin: Anticipate. Which, really, is only a half-true statement. It comes as part of the Elegant Themes membership and so yes, it does “cost” to get it, but its highly unlikely that you would get the ET membership just for this plugin. It’s more like a freebie for members only. In any case, the Anticipate plugin is designed to provide you with a means of displaying a Maintenance Mode or Coming Soon page to non-members of your site so that you can work on it in the background. It has an extremely simple settings panel under Settings > ET Anticipate Plugin. As you can see you are able to insert a logo, set a date for launch, set a percentage of project/site completion, and more. For any Elegant Theme member not running Divi, the Anticipate plugin is a great “free” tool that can serve all your Coming Soon Page needs. For those of you who are running Divi, it comes with it’s own page template and module settings that provide you with all the tools necessary to create a killer Maintenance Mode or Coming Soon Page for your WordPress website. 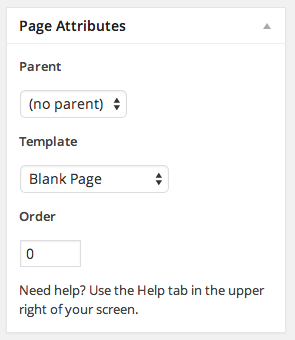 All you have to do is create a new page with the blank page template selected. 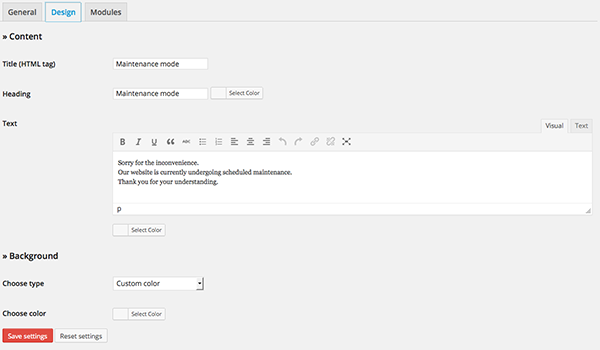 Next, using the Divi Page Builder, select one of the following page layout option: Maintenance Mode or Coming Soon. Depending on which one you select you’ll have something that looks like the following two images to begin working with. Just like on any pagebuilder page you can add or subtract any of the Divi design modules you want until you’ve achieved the perfect page. Perhaps the one drawback to using Divi to build your Maintenance Mode or Coming Soon page, instead of one of the above, is that it does not redirect every page to your new splash page. Which means if someone were to go directly to a subdomain of your site they would still see that page. 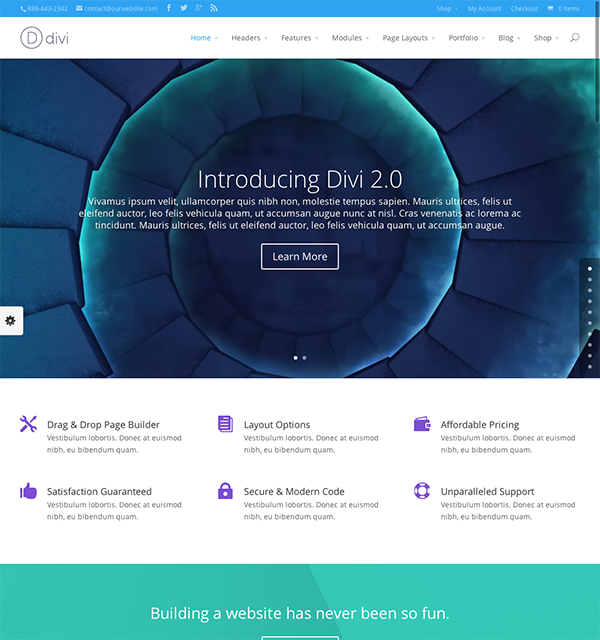 In all things design though, Divi is a great choice. Any of the five tools I’ve gone over today will do a good job for you when it comes to quickly and easily creating a great looking Maintenance Mode or Coming Soon page. If you’re not an Elegant Themes Member then my personal suggestion would be to go with WP Maintenance Mode. Out of all the first three plugins it somehow struck the best balance between simplicity and versatility. It’s a great free plugin. On the other hand, if you are an Elegant Themes Member then I’d go with either Anticipate or Divi. Obviously, if you’re already running Divi then it makes sense for you to just use it for you Maintenance Mode or Coming Soon page. However, you may want a more “complete” tool that goes beyond a splash-page home page; something that redirects everything to one page while you work on the rest of your site. In that case, and for anyone not running Divi in the first place, I’d recommend using Anticipate. But that’s just my take on it! Have you used any of these plugins yourself? What did you think of them? Leave us your thoughts in the comments below. And? Is Extra theme comming soon? What’s a landing pag? See #2. The recently updated version of WP Maintenance Mode has number of serious bugs IMHO. 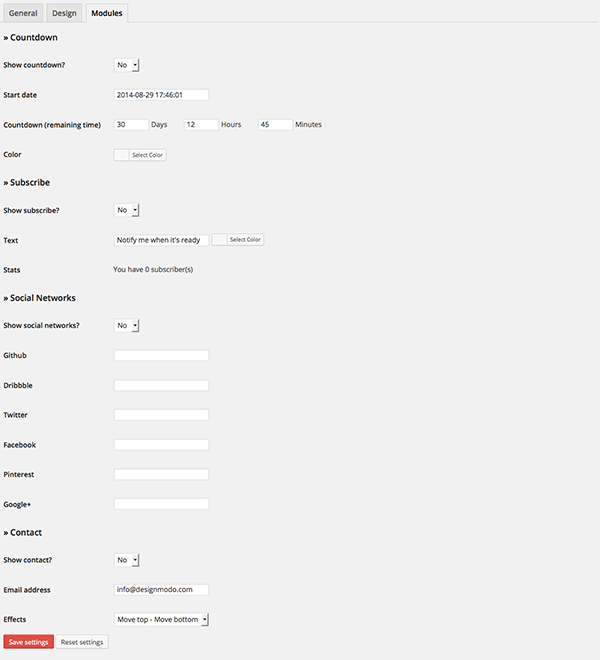 For example the Backend Role & Front End Role settings appear to be entirely unreliable. I have now removed the latest update from all sites where I previously used this plugin and reverted to the latest version by the previous plugin author (the plugin was recently taken over ). Though the plugin had not been updated for some time, that version continues to work for me without problems. I think you’re wrong, it works perfect for me. Very good free plugin. At the risk of sounding like an ElegantThemes Lifetime Member running Divi who wants to be as lazy as possible, it would be nice if a Divi Maintenance Mode template was included in future versions… meanwhile, I’ll just make one myself. I think there is one if you look under the page templates. I believe there is an example in the article also which is the very last picture before the conclusion. 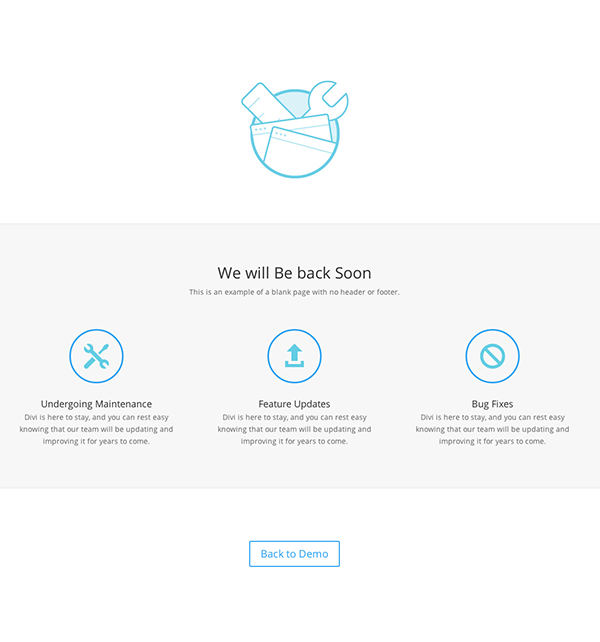 I like the idea of using Divi to create a maintenance page, but I agree with Buck. If it had the redirect functionality built in that would make it a more complete solution. Also, using a theme to create a maintenance page is fine as long as you are not intending to alter that same theme or you could end up with a jumbled maintenance page. Anybody know if the other plugins have the ability to redirect to the maintenance page for non-admin users so that you can work on the theme and see live updates whilst other users get the maintenance page? Nice list Nathan, I’ve used WP Maintenance Mode many times but other plugin you mentioned are also looking good. Thanks for sharing. Coming Soon page is an awesome readers engagement strategy, even when blog or website isn’t online. Useful Post, Nathan. I like how Anticipate plugin display a Maintenance Mode or Coming Soon page to non-members while I’m working on the website. Unfortunately, it is outdated, i.e., not responsive, and doesn’t look well with the more up-to-date theme, i.e., Divi. Great list! I already use WP maintenance mode and works fine for me. Hey guys, Adrian from Designmodo here. 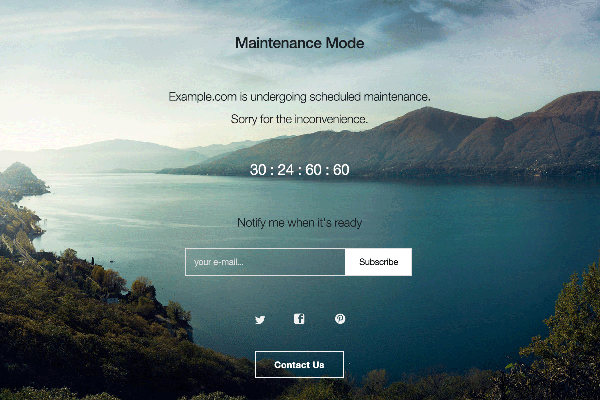 I’m happy to answer any questions you have about WP Maintenance Mode, we’re developers of this free plugin. We really enjoy crafting digital assets for designers and web developers. I’ve used the Under Construction plugin for a while now. It’s very simple, doesn’t come with tons of bells and whistles like a countdown or anything, but it gets the job done and takes 5 min of setup. Hi, Thanks for a nice list of all coming soon WordPress templates. 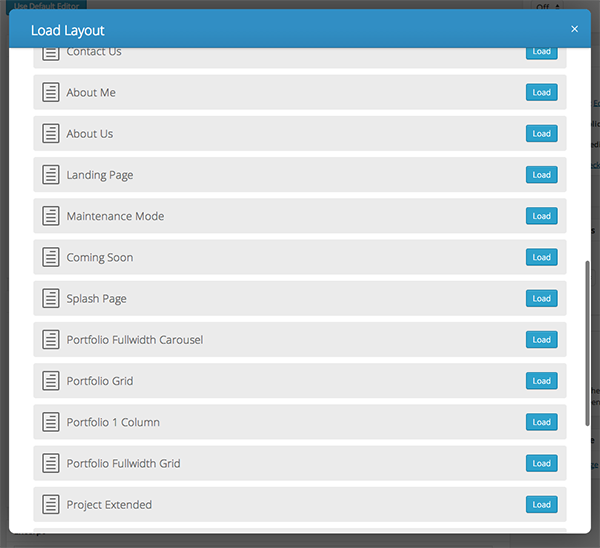 Recently I develop a coming soon template for WordPress called Level UP. 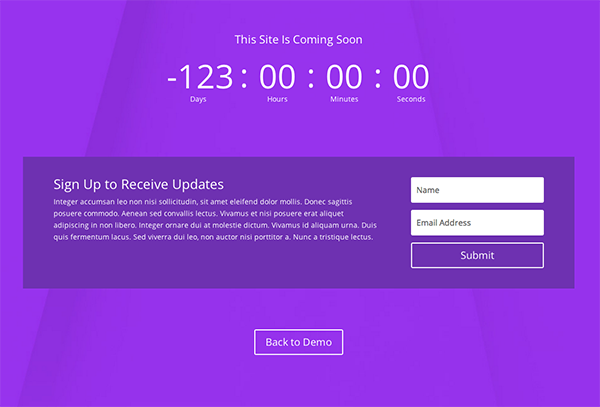 It’s come with all necessary features like dynamic countdown timer, email signup, contact form etc. It’s come with two different version, Parallax & background slider. We use a very popular WordPress option framework called CodeStar for Level UP options. It’s html version is available for free. And WordPress version is paid in my site. they all sound good but the most important feature that you haven’t posted screen shots for is how they prompt you in the admin that maintenance mode is on. I have inadvertently left maintenance mode on so many times because the plugin I’ve been using gives a message that doesn’t stand out. This wasn’t helped by WP changing from coloured backgrounds on messages to white. Wow, Thanks for the Post. searching for the plugins, now i found it. can we do editing if we enable maintenance mode on WP?? Once you’ve created a Coming Soon page with Divi, how do you get it to display as your home page? I was wondering the same thing, once you’ve created a maintenance page with the divi builder how do you set that page to display instead of the home page??? Just go to Settings > Reading and select the option to make your home page a static page, then set the static page to be your coming soon page.